Google has penalised BeatThatQuote in its search rankings, two days after the search giant acquired the UK comparison site for £37.7m. Search Engine Land, yesterday, reported BeatThatQuote had lowered in Google’s search rankings – a penalty used by the search giant when companies do not adhere to its webmaster guidelines, which detail its methods of dealing with illicit search practises. 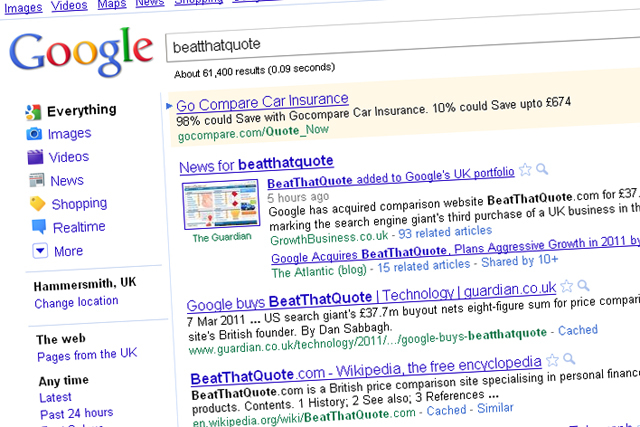 Today, while BeatThatQuote is still indexed in Google, it no longer appears in natural search results. BeatThatQuote.com, which was set up in 2005, is a price comparison site for financial products and loans, spanning insurance services, mortgage rates and credit card rates. SEOBook yesterday published a report about BeatThatQuote's aggressive SEO, such as link buying, which does not adhere to Google’s guidelines. Google declined to comment. BeattheQuote was unavailable for immediate comment.